Today's post is going to be short and sweet. We are going to be swatching all of the Ofra Cosmetics highlighters! 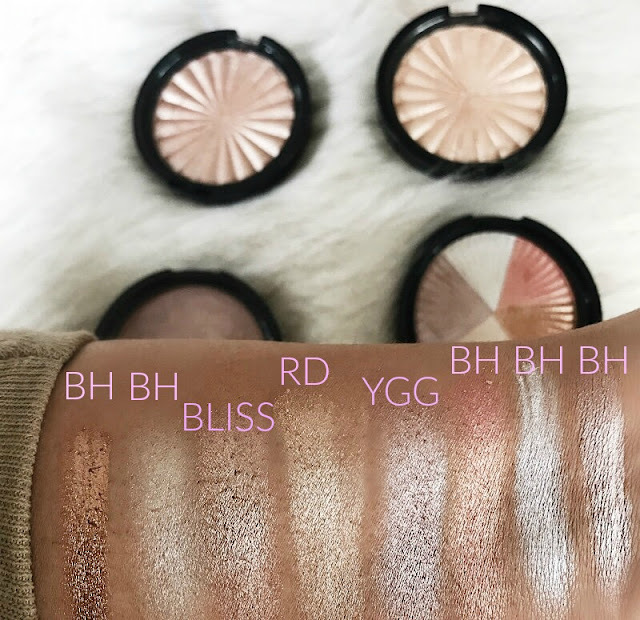 I wanted to share these highlighters with you guys because they are some of the most talked about products that Ofra makes, and for good reason. These little things are super super pigmented and come in colors that work with every skin tone! Being that this is a #QuickPost I'm not going to talk your ears off ( like normal ) about these products, but let me tell you they are a must have. Ofra makes around five individual highlighters and a few other refill pans. You can also buy all of the highlighters in one convient palette as well. First off the formula. These are not those powdery, shiny powders that a lot of brands have been putting out recently...They are super metallic, metalized powders that give that super intense wet look to the skin. They last all day on me and if anything I would say be careful that you don't over apply these bad boys because the pigment is out of this world. Now being that these are extremely pigmented, they are going to last forever before you'd need to buy a refill...But with that being said these are on the higher end side when it comes to price. The individual pans retail for $35.00 and the Beverly Hills highlight which is a five - in - one split pan retails for $39.00. Now I personally don't work via affiliate-ships so I don't have a promo code to give to you guys to bring the price down, how ever my friend and collaborator with Ofra Kim Thai does have a code that I believe is just KIMTHAI at check out and that will lower the price from $35 to $24 & The BH highlighter from $39 to $27. ALSO while your at it be sure to pick up Kim's Collaboration with Ofra called - Wanderlush. My favorite moisturizer for underneath my makeup, created by Kim herself! RD - or Rodeo Drive Highlight : A true honey gold shade perfect for medium to dark skin tones. BH - or Beverly Hills Highlight : A Five - in - one split pan with five shades. Covers the whole line of the Ofra highlighter shades. From super light to dark, this pan has it all.